"The Fair Housing Center of West Michigan was great. We needed help asking for a reasonable accommodation to pay rent on the 4th of the month due to not receiving the disability related income until the 3rd of the month. The Fair Housing Center contacted the housing provider and assisted in getting the rent due date changed to the 4th of the month. The service we received was outstanding. More people in the community need to be aware of their rights. Fair Housing is an excellent program and I am thankful for their service." "We decided as a Company to have Liz from the Fair Housing Center of West Michigan come to our office and put on a class, it was a great decision. Liz was able to walk us through her presentation and answer all of our questions on a smaller scale. It was great to have that one on one question and answer time for anyone from our Property Managers to our Maintenance Technicians. We were also left tons of information to keep in our office for future use. We will be signing up for this again next year, Thanks Liz!" 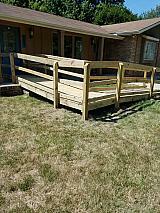 "The Fair Housing Center of West Michigan along with the Michigan Department of Civil Rights were able to get our landlord to allow us to have a wheelchair ramp installed that the landlord previously denied permission to do for more than two years. Because of the services of the Fair Housing Center of West Michigan my husband (who uses a wheelchair) and I, can now get in and out of our home much easier and can enjoy life outside of our four walls again!" "You were able to explain the Fair Housing Act and what we needed to send to my husband's doctor in order to verify a need for an assistance animal. The information you gave to us was very helpful and we gave it to our Condominium Association. We and the dog are now residents and we would not be here without you." "The Fair Housing Center is the go-to resources for property managers and others who want to make sure their sales efforts, leasing policies, and management practices are open and fair to all potential customers. Fair housing laws can be complex, so we've appreciated the guidance and education the Fair Housing Center offers."